A new report from the CCPA takes a closer look at child care fees in Canada’s biggest 22 cities and shows just how unaffordable child care has become everywhere outside of Quebec, the only province in Canada with universal subsidized child care. a new child care affordability index juxtaposing child care fees and young women’s median market incomes by city. 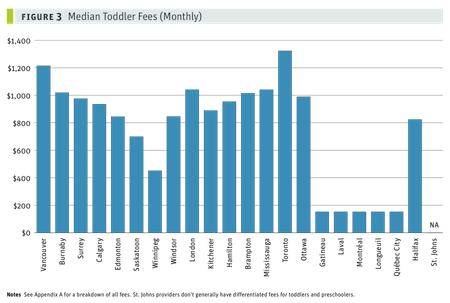 One of the big takeaways from the report is just how different child care fees are in different cities. 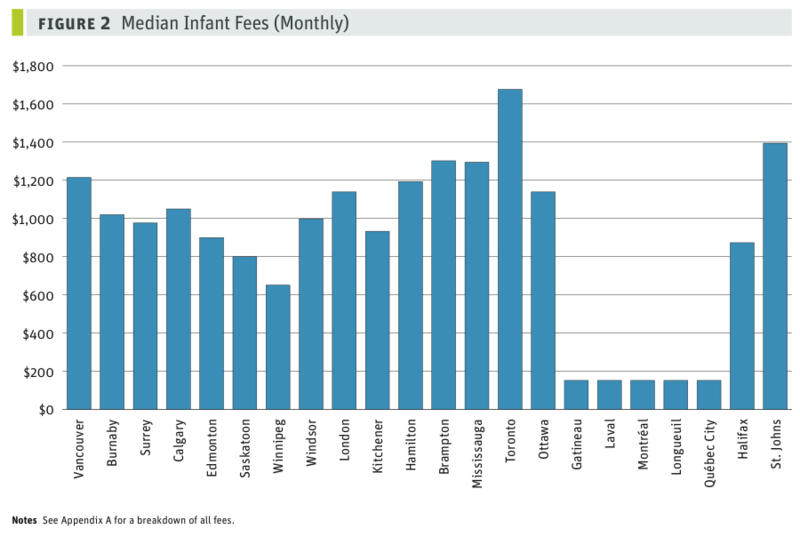 For example, median fees for an infant (less than 1.5 years old) vary from $152 per month in Quebec to $1,676 in Toronto (ten times as much!). Even assuming parents are using the full year of parental leave available in Canada (and we know many don’t), parents in Toronto are paying over $9,000 more for the six months their child would need infant care than parents in Quebec. 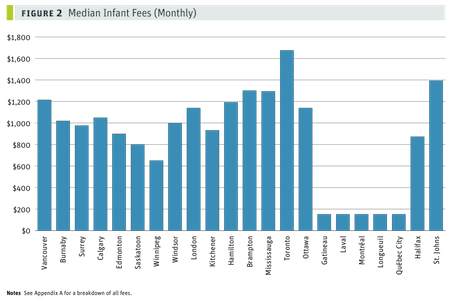 Outside of Quebec, the lowest infant child care fees are found in Winnipeg at $651/month and Saskatoon at $800/month. 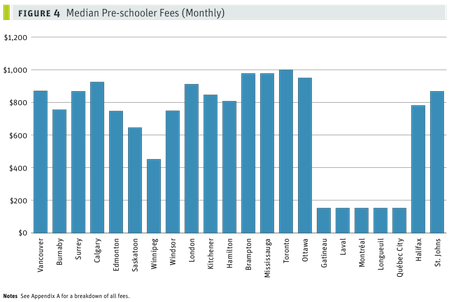 Even among provinces without universal child care programs, the difference in fees is staggering. In BC, infant child care fees are lowest in Surrey at $977/month, slightly higher in Burnaby at $1,020/month and significantly more expensive in Vancouver at $1,215. This means that parents in these three cities pay between $5,000 and $6,400 more for just six months of infant care than their peers in Quebec. 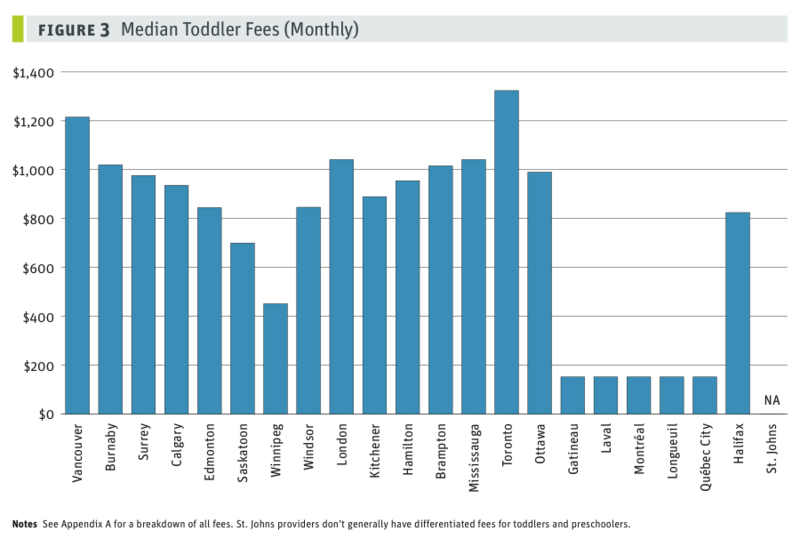 The median child care fees for toddlers (ages 1.5 to 3) and pre-school aged children (ages 3-5) show similarly large variation across cities, though the fees are a bit lower. The Parent Trap also tells us that child care fees eat up 23% or more of women’s median yearly income everywhere outside of Quebec and Winnipeg. In other words, women in these cities work two and a half months or more to cover the costs of child care. Shockingly, in nine our of the 22 cities, child care fees exceed 30% of the median yearly income for women. How do BC cities stack up? Surrey is the second least affordable city in Canada for women with young children. 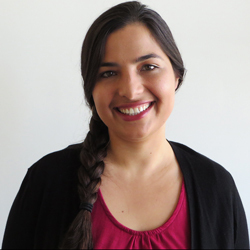 Although fees in Surrey are lower than in Vancouver, incomes are much lower and as a result child care fees eat up over four months of the median yearly income for women (35%). Only Brampton is less affordable for young parents than Surrey. Vancouver and Burnaby rank in the middle of the pack, 1oth and 12th least affordable, eating up 29% and 27% of women’s median income respectively. It does not have to be this way. A national universal child care plan would be ideal but in the absence of federal support, provinces could show leadership, follow Quebec’s example and introduce their own universal affordable child care programs. In BC, implementing the widely-endorsed $10/day child care plan would lower fees for parents to only $217/month. For Surrey and Burnaby parents of toddlers, this would save over $9,o00 per year in child care costs. For Vancouver parents, the savings would be closer to $12,000 per year. The $10/day plan would make BC’s cities the most affordable of in all of Canada outside Quebec. At $217/month, child care fees would take up only 9% of Surrey women’s median income, a much smaller bite than the 35% it takes today. For families with young children, this would mean more economic security, better quality of life, less debt, and more women freed of child care responsibilities entering the workforce or getting the training and education upgrades they need.